19 shorts out of the 32 got a “yes” answer 50% or more -keeping stable the percentage of films exceeding the half-empty/half-full threshold compared to 2009. And the Award remained in Spain. 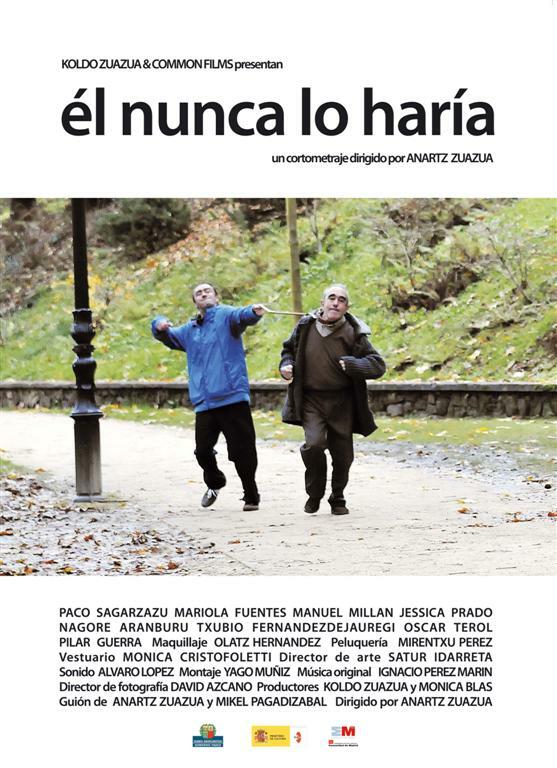 “El Nunca Lo haria” (He’d Never Do That), Spain, by director Anartz Zuazua. It is Zuazua’s first film as a director! What does he have to say to the Greek Audience? <<I’m very happy for the award, and I would like to thank the festival for giving me the possibility to show my short film there. I would like to thank the audience also for the award they conceded me. It’ s my first short film as a director and it’s really important to receive this award, because I understand cinema as something made for the audience>>. Well, then you should have been there Anartz, to see how irresistible your short was -a short dealing with the delicate issue of how societies treat people of old age, in a totally unexpected, in-your-face way but also with a redeeming humor that permitted the audience, not to laugh away the issue but to let it sink in in a tolerable manner. 2nd in the Competition Section was “Corporate” (Italy) by Valentina Bertuzzi, a short taking to its logical conclusion all the “Help” devices we gradually accep into our life – what if emotional and psychological advice came no longer from friends or certified doctors, but from AI machines speaking to us through our bluetooth earplug? 3d in popularity was, again, a short from Spain. “Maquetas” (Miniatures) by Carlos Vermut, was a short-short of 4 minutes, with a wow! idea: interviewing emotionally struggling survivors of vintage “Japanese & co” monsters’ attacks! It was also the short for which many members of the audience felt compelled to single out in the “comments” section of the questionnaire.